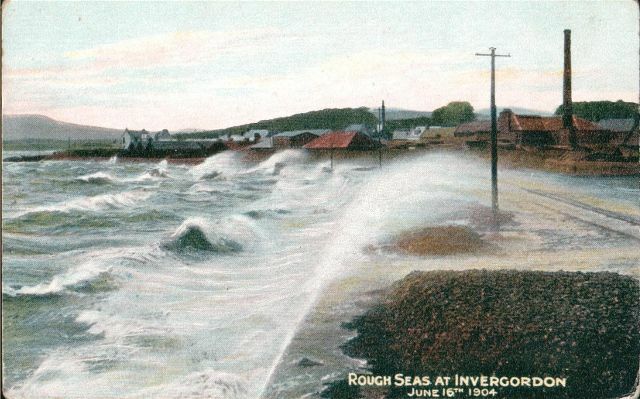 A delightful tinted postcard taken from the sea front near to the Ship Inn, looking north-west. The chimney on the right is near one of the saw mills while the chimney just right of centre is for the saw mill by the station. I've just bought another copy of this postcard, sent to London from Invergordon in September 1904 by Alf, who must have been a navy man. He says "What do you think of this for rough weather. We are leaving here Sunday for Newcastle." The card was published by Macpherson Brothers, Invergordon and Beauly. The chimney in the foreground - I always thought this was from the cooper mill.